Amiyat Dantooine had a successful first show year! - Kashmani uppfödning av salukis och shetland sheepdogs (shelties). Karin Hedberg. FCI internationell exteriördomare hundutställningar. Amiyat Dantooine had a successful first show year! During 2016 "Donna" won 6 CACs and 2 reserve CACs when shown in the junior and intermediate classes! She was expertly shown by (most of the times) Elisabeth Levén, and once by another expert, Marie Frisén, (below) and sometimes also by myself. 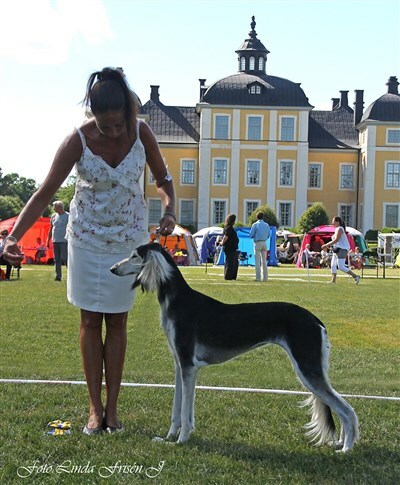 This photo is from the Stromsholm Sighthound Club Show in August, 2016, where Donna was BB2 with CAC in huge competition! Judge: Saluki specialist Jenny Macro, UK.